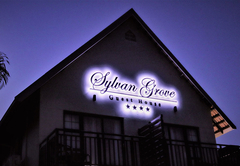 Sylvan Grove is a 4 star graded B&B offering Umhlanga Rocks accommodation in 6 guest rooms. 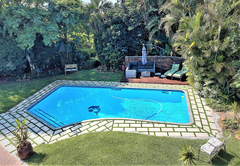 Located in Umhlanga Rocks, the finest holiday resort in KwaZulu Natal, Sylvan Grove is set in a tranquil tropical garden with sparking swimming pool and prolific bird life. 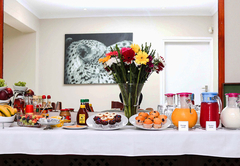 This gracious Guest House offers affordable accommodation for the discerning business and holiday traveller. Close to all beaches (1000 meters away), shopping centres (including Gateway Shopping and Entertainment Centre) restaurants, and numerous sporting facilities. 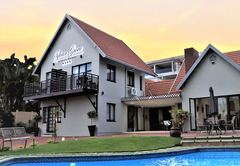 Although it is just 10 minutes North of Durban CBD, International Convention Centre and uShaka Marine World, this 4-star Guest house is set away from the hustle and bustle of the busy beachfront and is the perfect retreat to relax and unwind. 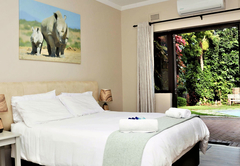 Our luxury air-conditioned rooms are spacious, individually decorated and all have en-suite bathrooms. Sylvan Grove has five double rooms and a Family Suite suitable for two adults and two children. 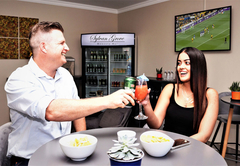 All rooms have telephones, wireless Internet, multi-channel TV, radio, ceiling fans, tea and coffee making facilities and fully stocked bar fridge. 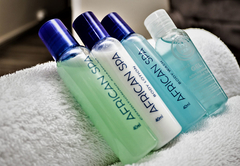 All of our rooms are serviced daily and we provide a laundry service. Children over the age of four are welcome and hosts Jill and Chris are on hand to make your stay enjoyable. Please note Sylvan Grove is a non-smoking establishment and smoking is restricted to outdoor areas. You will be delighted with our hearty English and continental breakfast, freshly ground filter coffee and a selection of the finest teas. Enjoy the coolness of our sparkling swimming pool with a chilled drink at the end on the day. For the sports enthusiast there are numerous facilities nearby. Golf, tennis, bowls, gym, horse riding, nature walks, deep sea fishing, scuba diving, and micro light flying are all actives which are located close to Sylvan Grove and can easily be arranged. The public Blue Flag beaches are safe for bathing and are a stones throw away. For out-of-the-way activities, we can arrange sailing trips, whale and dolphin viewing, tours to our famous game reserves with the Big 5 (Hluhluwe and the St Lucia Wetlands). A Durban City Tour can be arranged as can excursions to a Crocodile Farm and Zulu Cultural Village. Our coast is renowned for its numerous and scenic golf course, so bring your clubs or hire them and take full advantage of what this wonderful area has to offer. 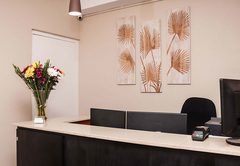 We pride ourselves for offering an efficient laundry service, Braai (barbecue) facilities, wireless internet access, internet station for guests use, fax and photocopy facilities. Secure off-street parking and the arranging of tours. 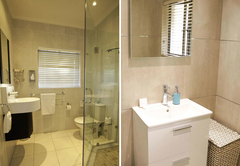 Family suite of 2 bedrooms, en-suite bathroom with bath and separate shower and private patio onto the garden and swimming pool. 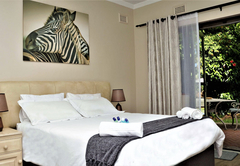 The family suite is suitable for 2 adults and 2 children or 4 adults. We had a fabulous time at Sylvan Grove! Our room was large, super comfy, the service from the staff was friendly and accommodation and we found this guest house to be very good value for money in the area. I have no hesitation in recommending SG! Response timeSylvan Grove typically responds to requests in 5-10 minutes. Child policyChildren over 5 years are welcome but parents are advised this establishment has an unfenced swimming pool. Check in after 20h00 by prior arrangement.